The Hutt City Council Laing’s Road complex is an excellent example of postwar modernist architecture, and an integral part of the Lower Hutt Civic Centre Historic Area. The precinct includes the original 1950s Administration Building, a west wing extension and the cafeteria to the south, along with the Council’s Civic Halls. Leading by example for CBD revitalisation was a guiding principle in the recent redevelopment of the Precinct. The aim is also to support a flexible, responsive, and adaptable organisation which improves staff satisfaction and provides better service delivery. 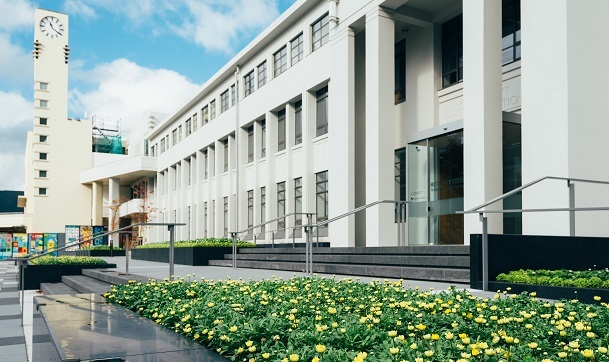 RDT Pacific guided the Council through an options analysis for both the Administration Building and Civic Halls, outlining the economic impact and community benefits for each option. Previous ‘siloed’ workspace configuration hindered productivity and communication, and constrained the growth of the team. The project completely refurbished the fitout to revitalise the office culture and business model. Greater flexibility will support future changes and any potential amalgamation. 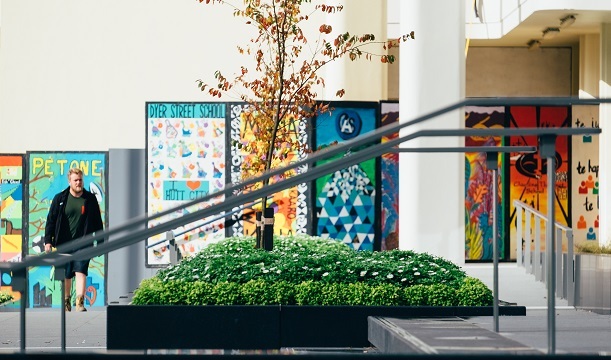 While the space is a better environment for staff, its benefits for the Council lie in having a quality, fit-for-purpose building which reduces operating costs. 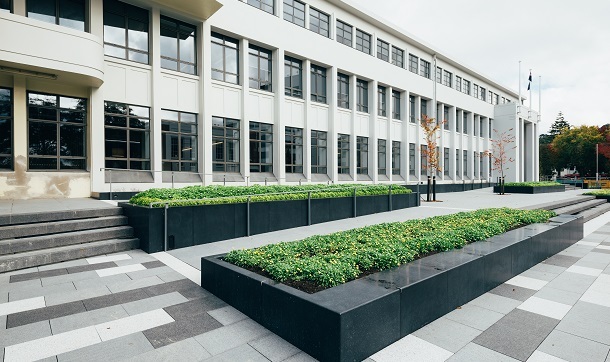 The administration building and Civic Halls had serious structural issues to remediate, and were below the 67% of New Building Standard (NBS) required by Hutt City Council. Constructing a additional annex behind the original building strengthened the Administration Building, while retaining the façade and some internal structure. RDT Pacific led the investigation into a structural solution that pushed the boundaries in the design concepts associated with the expensive, time-consuming façade retention. The result was a system that met structural requirements while forgoing temporary façade bracing. This allowed building works to be fast-tracked, leading to significant savings. The project was broken into three work streams. The first demolished the west wing and super room of the Administration Building, retaining the north and south façades, strengthening to 100% NBS to Importance Level 2. Another stream provided safe temporary accommodation for Hutt City Council staff during strengthening works. 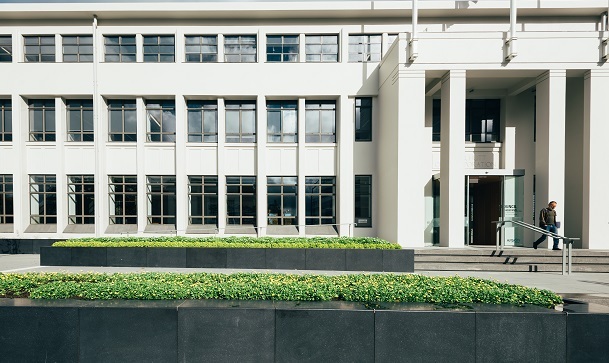 Third, the Halls were strengthened to 100% NBS at Importance Level 3 and reconfigured to suit user requirements, while façades were also retained. 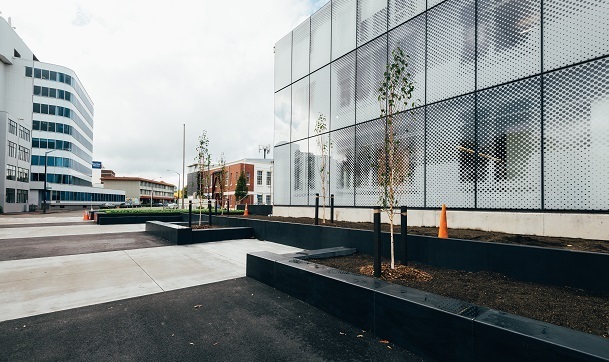 This project is an opportunity for Hutt City Council to demonstrate leadership in connecting Environmentally Sustainable Design (ESD) with seismic improvement and heritage protection. It acts as a catalyst for the CBD revitalisation. Involving RDT Pacific from Business Case development ensured the project involves sustainable solutions as part of the brief. This led to numerous ESD solutions such as the ground source heat system – the first of its kind in NZ – and solar power integration within the heritage architecture and roof profiling.